10% deposit to secure the rooms. Should the group cancel, the deposit is retained. 1)	Up to 90 days before arrival: You may cancel the group without any cancellation fee up until 3 months prior to arrival. 2)	Between 60 to 90 days before arrival: Based on the status update on 90days before arrival, you may cancel up to 50% of room nights without a cancellation fee. 3)	Between 30 to 60 days before arrival: Based on the agreed block 60days before arrival, you may cancel up to 25% of room without a cancellation fee. 4)	Any room nights cancelled within 30days of arrival incur a cancellation fee equal to all room nights cancelled. A credit card number must be given as security for any group bookings to cover any damage or additional charges incurred. A key bond of $10 per key issued must be paid. Located in the heart of Aoraki Mount Cook Alpine Village in the Aoraki Mount Cook National Park, this is a 'must do' for your NZ itinerary. We have a great range of quality accommodation options to suit all budgets and tastes. All rooms include ensuite bathrooms, quality linen, refridgerator and a patio or balcony so you can soak up the stunning mountain views. 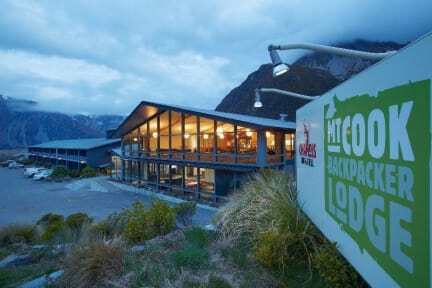 Great hostel right in the Mount Cook national park. Highly recommend it. At night, look up at the stars...and in the morning, get an amazing view of Mt Cook from the hostel. Basically bunk beds in a hotel room. Bathrooms have baths in which was nice to take advantage of. Shared kitchen gets pretty crowded at peak meal times. Bar/restaurant is very nice. Reception provide you with a map of the surrounding walks and information on them, which is very useful. Careful there is NO supermarket / grocery in the area ! Hostel was clean and room was pretty spacious (4 bed dorm), it had a nice balcony and en suite too. Staff were friendly and the location was good. However, the kitchen was quite run down, no free WiFi, laundry was expensive and upstairs restaurant wasn’t very backpacker friendly because it was expensive and there weren’t any good deals! It’s an ok place to stay for 1 or 2 nights, bring your own food so you don’t have to eat at the restaurant. I had a good room with a few. The bathroom is a little outdated (mold issues). The check-in process was not the best, upon arrival I was informed my room would not be ready for 4 hours which was a little disappointing. It would not have been an issue if it hadn't been raining so badly that day or else I would have hiked around. A little over priced for a basic hotel. We stayed in a shared hostel room, and it was a little overpriced for the value. Don’t expect quiet, or much privacy, but everyone we interacted with was very friendly and appropriate. The laundry facilities were very accessible, and cheap, but the shared public area left a lot to be desired when it came to cleanliness. Bring your own food, unless you are wanting to spend a lot on dining out at the restaurants. The nearest convenience/grocery store is in Twizel. Okay place to stay but for the price, to not provide wifi or towels is a rip off. The kitchen was pretty dingy too and no real common area. Rooms are okay but the beds were really squeaky. Bathrooms were clean and the showers were good and hot. I understand its in a great location but seriously overpriced! Arrived at 13:45 and they told us check in was at 14:00. Fair enough. So we went out for some lunch and came back at 15:15. Then someone else told us our room wasn't ready and that their rooms are ready between 14:00 and 17:00. He didn't seem to care at all about the inconvenience to us. Lame customer service in my opinion. A great location, but that goes for everything around Mt Cook. The rooms are sized good, nice that they include a bathroom and toilet in the room. Altough it's not squeeky clean, but I didn't expect that. The kitchen is not great. So many people in such a little space, cooking. But the restaurant is so expensive that you want to cook for yourself. You can park just in front of the building. The public toilet were gross, I'm happy we had our own in the room. Overall, not bad, but not good either.